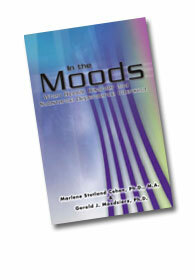 Brief as it is, In the Moods, goes beyond a clinical discussion of symptoms and current treatments providing valuable information, understanding, and a hopeful message for all those touched by mood disorders and substance dependence. In the Moods is featured in the November 2004 issue of the Private Practitioner’s Chapter of the Canadian Counselling Association Bulletin and the March 2005 issue of Cognica (the newsletter of the Canadian Counselling Association). In the Moods , is written in clear, everyday language geared to the individual who is struggling with bipolar disorder and substance addiction. The authors begin by speaking to the person struggling with this dual diagnosis in the first person - a useful approach in engaging the reader to consider the implications of a combination of a mood disorder and substance abuse problem. The book is written from an Adlerian perspective maintaining it is the individual's creative power in forming lifestyle scripts before the age of four that determines the eventual degree of participation in life's responsibilities. Discouragement and increased feelings of inferiority along with predisposing biological and environmental shapers can also play a role in this dual diagnosis resulting in emotional reactivity, cognitive style and the choice of affect over logical thinking.